A blog hop is just one big loop of fun ideas as you visit each blog along the way. If you are coming from Miss. Carrie's Creations, you're on the right path. If you are starting here, just look for the link at the end of my post (and successive posts) to see which blog to visit next. One of my favorite papers from the new Annual Inspirations idea book is the Basics Fundamentals Paper Packet. This is just one of 7 double layouts that I created for my Half-pack Basics Fundamentals Scrapbook Kit. For the entire kit, in addition to a half pack of the Basics Fundamentals packet, I used most of a combo pack of new basic cardstock, some White Daisy cardstock, and a few sheets of the lovely new color of the year, Bashful cardstock. I'll be looking forward to sharing the other 6 layouts from this kit in a few weeks. My class reunion is coming up this weekend so I decided to use one of the 7 double layouts for a reunion layout. just released in this idea book. CTMH Cricut YOU ARE HERE Collection. Golden Moments Cut Above card kits. Since it is a "Golden" event, the 50 is cut from our beautiful new Gold Foil Paper. **Just a note -- I really like the new two toned cardstock. Such versatility! 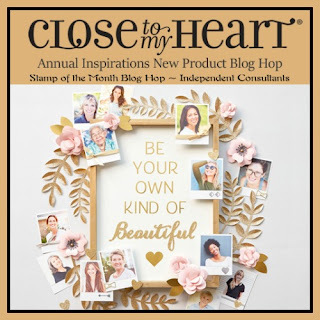 Join me as we hop on to see what new products Jen Rubio is showcasing. All the participants in this blog hop are listed here if per chance you need to get lost along the way. Stunning layout, love the colors, and the design for the layout. Another awesome upscale use of the card kit! Beautiful! The new greys combined with Bashful are perfect together. I love how you also addded the Cut Above kit to show how it can be used in a different way. This is fantastic! I will be sharing with my mom - here 60th class reunion is next year. Very nice pages. Good color combo. Beautiful and elegant layout. Love it! Beautiful layout! Loved your idea for using the cut above kit on your layout. This layout is gorgeous! My 50th reunion was this past weekend. I hope you have as much fun at yours as I did at mine!